How’s it going? No episódio de hoje, você ouve mais sobre duas partes do corpo (na perna) sobre as quais a gente não fala muito, e fica familiarizado com estas palavras. So today I’d like to talk about some body parts that I know are not that well known by English students. What inspired me to talk about them was the term keep your chin up. The chin – c-h-i-n – is the part of the body that is right below our lower lip. So ‘keep your chin up‘ is an expression of encouragement, right? It means, remain confident and maybe cheerful in whatever tough circumstance you’re going through. Keep your chin up. Chin, then, made me think of shin, which is a body part that is in the leg. Look at the picture and you will see where the shin is. OK, so notice that I just spoke about an idiom with “chin”, which is below the mouth. Chin. Now I’m talking about the shin, which is right below the knee. Shin… S-h-i-n. And notice that I am not saying “sheen”, as in “Charlie Sheen”. I’m saying ‘shin’ – check out my pronunciation tip to learn more. So apparently shin splints are a very common form of leg injury. I looked for the expression in Portuguese and found “canelite” – I’ve never heard this word before so if you have, please let me know if that is what we really say for shin splints. Basically, almost any kind of pain you feel in your shin as a result of exercising will fall under this category – shin splints. And I found out that most shin splints occur when there is more stress on the tibia than it can handle, so – there you go. So the shin is in the frontal part of the lower leg, right? On the other side we have the calf. Calf – c-a-l-f. The calf is the back part of the leg. Notice the way we pronounce calf – it’s the same as half. Also, the plural form is calves, just like the plural of half is halves. One calf, two calves; one half, two halves. 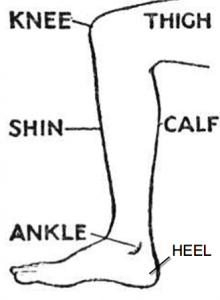 Calves are very fleshy and muscular, and of course, calves can be injured as well. You can strain your calf, for example. Apparently that happens a lot to tennis players. I don’t think I’ve ever strained my calf, but it sounds painful. So let’s talk about calves a little bit more. Here’s a popular way to make your calves more muscular: are there any stairs where you live? If so, stand on the edge of a stair step. Be careful – don’t lose your balance! Then, stand straight and lift your heels until you’re standing on your toes. Stay there for two seconds, lower your heels and repeat the movement. That’s it – simple. Tell me – do you know anything about shin or calf injuries? Do you exercise your calves regularly? Let us know in the comments, and talk to you next time! Instead of canelite, you must say Canelada. Ele tomou uma canelada, significa que ele machucou a canela. OK Rubio, mas acho que ‘canelite’ seria o nome da condição médica. Isto é, o que te dá depois q vc toma uma canelada. Hey Thiago :-) I’d forgotten about caneleiras.. So that’s probably ‘shin pads’ in Portuguese. I asked my gym teacher about shin pads and he said football players do wear them since it’s common for players to knock shins every once in a while, and… that hurts. As a matter of fact, shin pads is “caneleira” in english. Hey, Ana. How’ve you been ? I loved your podcast on Business English podcast, I always know that you’re gonna talk about listening, but that’s great because it just keeps me motivated!